knowledge is power. this is an introduction to our long awaited functional art. 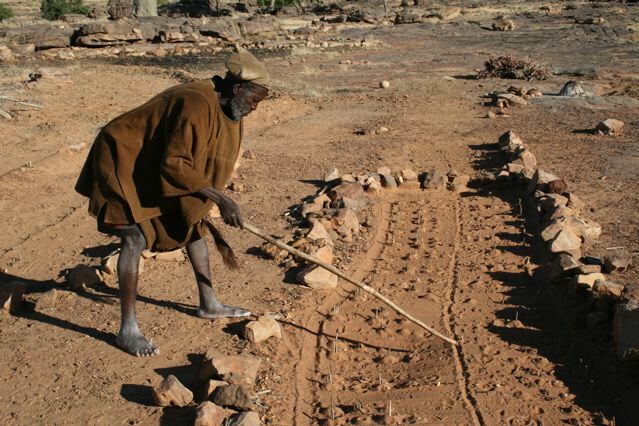 Dogon diviners derives meaning and makes predictions from grids and symbols in the sand. At dusk, he draws questions in the sand for the sacred fox to answer. 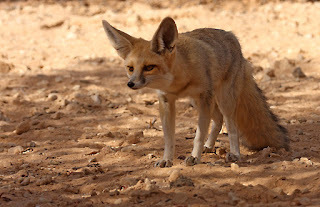 The Dogon people believe the fox has supernatural powers; in the morning, the diviner will read the fox prints on the sand and make interpretations. The fox is sure to come because offerings of millet, milk and peanuts are made to this sacred animal. One evening, as the sun began to set, a Dogon priest called a "diviner" traced an intricate drawing in the ochre sands that lie at the foot of Bandiagara Cliffs. A series of six connected squares and an elaborate set of symbols were drawn in a pattern that represent the potential futures of the family, the village, regional peace and harmony, life and death, and the wishes of God. The diviner next placed tiny sticks in the sand panels, representing God and the family. Several "I"-shaped tracings symbolized peace and death. Small heaps of sand with minute holes represented other concerns: harmony within the village, illness, next season's harvest, even one's own mortality. Will there be shame next year? Give me your nails to mark the sand. The Dogon priest finished his chant as the last light of the day lingered in the western sky and then disappeared. The priest returned to his village. 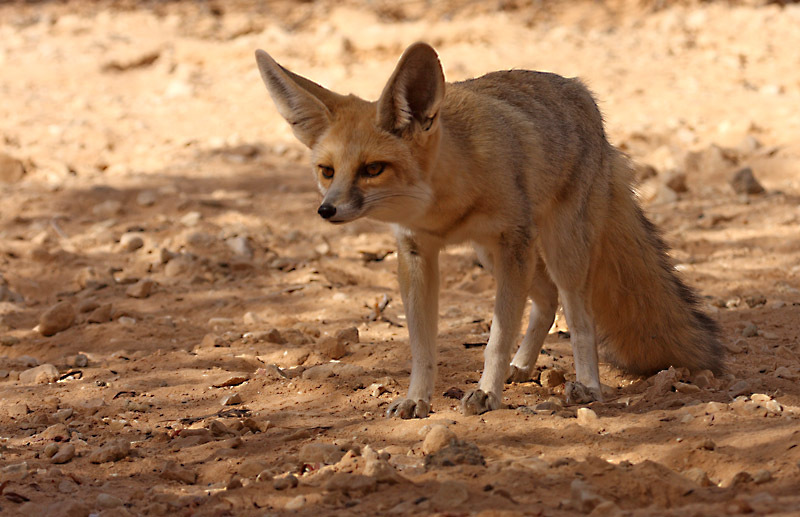 Nightfall invited the fox to visit the sacred Dogon markings. At dawn the following day, sunlight traced the shadows of the fox path across the sand drawing. Indeed, the fox had visited in the night during our trip and with its tracings had foretold the future of the village of Yougou Piri. With these fortuitous markings, the fox had symbolically acted out the ritual of an oracle, a Dogon tradition that keeps life in balance for yet another year. B.) POLES ARE MOVING ! SO WHAT TO EXPECT ? Magnetic north pole has moved 161 miles in 6 months only, this puts its arrival in Siberia in less than 2 years OR SOONER , and it is when it arrives there that it will have migrated 40 degrees across the northern hemisphere at this point the poles will shift at high speed over the equator until it reaches 40 degrees south. THIS INFO IS TO MAKE YOU AWARE AND ACT ACCORDING , IM NOT TRYING TO SCARE ANYONE BUT APPROACH THE INFO AND PHYSIOLOGICALLY PREPARE ONES WHO WILL LISTEN ,BY MAKING APPROPRIATE BASED DECISIONS ON CERTAIN FACTS ,THESE DECISIONS WILL AFFECT YOUR LIFE. IT IS A SLOW PROCESS UNTIL THE LAST MINUTE THEN THE COMPLETE SHIFT HAPPENS ALL AT ONCE! Southern California Gas Co. has temporarily relocated more than 130 families in the San Fernando Valley following a natural gas leak that has sickened residents for weeks. The gas company received 552 inquiries from residents asking to be moved, spokeswoman Kristine Lloyd said Friday. Some 250 customers refused the utility's help and decided to find housing on their own. A leaking well in the Santa Susana Mountains near Porter Ranch has elicited hundreds of complaints from residents and drawn the scrutiny of state regulators and health officials. The company has been directed by county health officials to pay for temporary relocation for residents in the affected area. Customers who made their own arrangements at a hotel over the holiday weekend will be reimbursed up to $250 per room per night, plus taxes and fees. The company is reimbursing customers for food as well. The gas company discovered the leak at its Aliso Canyon storage facility Oct. 23 and said it occurred in a pipe casing a few hundred feet below the surface of a well that goes 8,500 feet underground. The gas is flowing into the earth and seeping up through the ground, Southern California Gas said. It is emitting methane at a rate of about 50,000 kilograms per hour, accounting for about one-quarter of all methane emissions in California. The leak is also emitting mercaptans, additives that give the natural gas a sulfur-like smell and can cause symptoms such as nausea, dizziness, headaches and nosebleeds -- symptoms Porter Ranch residents have been complaining of since the leak began. "This isn't just the road, it's the mountain itself that's moving and it's pushing the road up," Public Works employee Paul Funk told KTLA-TV. Officials said a 2-mile stretch of the road has been closed to traffic and will remain closed indefinitely. Popular road used by residents and cyclists near Santa Clarita was closed Friday after a landslide caused severe buckling of the soil and pavement. The buckling was first spotted Thursday on a 150- to 200-feet stretch of road, which prompted the closure of Vasquez Canyon Road between Lost Creek Road and Vasquez Way. “The land is still moving,” said Steven Frasher of the Los Angeles County Department of Public Works. Engineers and geologists were examining the road to determine what was causing it to crack and move, he said. The hillside slipped but instead of spilling over the road, it went under the pavement, Frasher said. Now the road is growing upward and expanding. Notice. Santa Clarita residents who use Vasquez Canyon Road were advised to use Sierra Highway as an alternative route. Small landslides are not unusual in the area. But the large size of this type of buckling is “truly unusual,” Frasher said. SANTA CLARITA, Calif., Nov. 20 (UPI) -- Officials in Los Angeles County are warning motorists to steer clear of a road that warped and rose in some areas more than 15 feet after a landslide. The Los Angeles County Department of Public Works tweeted photos showing how a 150-foot stretch of Vasquez Canyon Road warped severely Thursday and Friday following a landslide in Santa Clarita. Officials said the unstable soil led the roadway to crack and rise in some areas more than 6 feet. Public Works officials said the road was continuing to warp Friday afternoon and residents were warned to steer clear of the area. Some people don’t believe in G-D. Some people know that inspiration is the way of The G-Ds. Of a new creation, a new country the mystery Babylon and chattel Black slavery to build it.what goes around comes around. We stand beside all major world religions and we are the world’s fastest growing movement, what is this mystery known as Rastafari: it is the only movement, ‘where’ its Icon has given its adherents gold medals as sign and symbol of its authenticity ,the only movement with its Icon being direct decedent from the seed of Jessie and David and Solomon, the biblical characters ,Rastafari Movement is the only movement where it’s Icon gave the ring of the dynasty to one of its adherents, the Holy Ring Of Solomonic dynasty was given The Prophet of The Rastafari Movement Bob Marley By The King Of Kings HIM self, again showing the reality and historical importance of Rastafari Movement, because The King Knew The destiny of the Rastafari Mystery, when it is said: “you are now in tune on the one the force itself” means you are getting Correct or information presented right in order (“Nuwabu”) this is to say right information or “sound right reasoning” this is known as Kabalistic wisdom, the Black man in North America spiritual science. Time-line :the year is 1930. 311 years after the first 20 slaves were brought to Virginia two movements were divinely ordained for the redemption of the black man held captive in the wilderness of North America…the nation of Islam and Rastafari Movment,Rastafari being more subtle yet both were mystical. Both Icons were reported to have died in same year 1975. We can see if we look closely the march is significant to the election…Now we will look closer at Mary and its relation to the nation’s capital etc. The sign Virgo is a great part of the esoteric architecture of Washington, D.C.
“the Virgin Mary” there is an origin between the Christian virgin and the virgin of the zodiac… the so-called “pagan” Isis has been transformed into the Virgin Mary of Christian mysteries…for all the Egyptian imagery that is found in Washington, D.C. the city is Greco roman in spirit… the above statement and observation takes us to the city of Atlanta Georgia. The minister Silas calls the Honorable Elijah Mu-hammad Mother Mary who gave birth to Jesus. Yes! Nation of Islam-Jesus} Elijah Muhammad is known here as Mother Mary… ? Was messiah to be born from Nation of Islam ? Was he Malcolm X ? Just shy of sixty years old, following George Washington’s orders, Banneker worked with surveyor Andrew Ellicott, taking the first measurements for the design of the federal city. In his journal Banneker records the full solar eclipse he witnessed in the field. He published six annual Farmers’ Almanacs between 1792 and 1797 compiling cures and treatments, lists of tides, astronomical data, including eclipses, all calculations his own. In Banneker’s almanac appears an illustration of the sign Virgo as a woman holding a five-petal flower. We have no evidence to connect Banneker with Freemasonry. Ovason, in his popular books, shows the recurrence of the sign Virgo, and symbols of Virgo, not just this five-petal flower, or pentagram, but Mercury, lord of the zodiac sign Virgo. In his view D.C. is a series of monuments to Hermetic Christianity; the Virgo/Pisces orientation of the city he believes invokes the Mary/Jesus apotheosis of the genders. Why this degree of Virgo? “According to medieval Arab astrologers,” Ovason explains, “this degree had a particular importance: it marked that point in the zodiac where the Moon was thought to promote the greatest happiness and well-being. We must presume, then, that the intention behind the choice of moment was that this beneficial influence would be transmitted into Washington, D.C.” Ovason writes that on August 10, 1791 the three fixed stars Arcturus, Regulus and Spica rose at sunset, forming a celestial triangle that inspired the design of the city’s Federal Triangle. In that Day there will be an altar to the Lord in the midst of the land of Egypt, and a pillar to the Lord at its border. And it will be for a sign and for a witness to the Lord of hosts in the land of Egypt, for they will cry to the Lord because of the oppressors, and He will send them a Savior and a Mighty One, and He will deliver them. "We have built no temple but the Capitol, we consult no common oracle but the Constitution. "&Mac220;Rufus Choate [former member of Congress]. September 1993 Calendar. The Capitol on the 200th Anniversary of the Laying of its Cornerstone on September 18, 1793, Published by The United States Capitol Historical Society, 200 Maryland Avenue, N.E., Washington, D.C. 20002(WRD). Capitol, n. [F. capitole, fr. L. capitolium, fr. caput head.] 1. The temple of Jupiter at Rome on the Capitoline hill [Capitol Hill; the "Hill"]. 2. The edifice at Washington in which the Congress of the United States holds its sessions; also, U.S. (often not capitalized), the building to which a State legislature meets; a statehouse. Webster's Collegiate Dict., 5th ed. 1947(WRD). According to the Cumaean Sibyl whose prophecy formed the novus ordo seclorum, the New Pagan Golden Age begins when the "son" of promise arrives on earth—Apollo/Osiris incarnate. White people are melanin deficient. Melanin is what protects the melanin dominant peoples of this planet from the Sun God ATOM RA's Radiation poisoning in the form of UV exposure. They hide the Sun because the SUN is the SUN (SON) of GOD (Aten/Atun/Atom)RA. Name the one that is destroyed in coming face to face with the Divine Rays of the Sun of God. Not so for white people. You do not have this protection. As a result, you undergo PHOTOLYSIS. Photo dissociation, photolysis, or photodecomposition is a chemical reaction in which a chemical compound is broken down by photons. Specific to your case, Photolysis is the phenomena by which Amino acids and various essential vitamins decomposed by U.V. exposure. More importantly, Folic Acid decomposes very rapidly on U.V. exposure. As Folic Acid is a major requirement for sexual reproduction, exposure to U.V. will render white people STERILE. Human populations native to areas of intense sunlight tend to be heavily melanized. Previous explanations for this relationship have invoked only weak selective pressures. To test the hypothesis that dark pigmentation may protect against photolysis of crucial light-sensitive vitamins and metabolites by ultraviolet light, folate was used as a model. It was found that exposure of human plasma in vitro to simulated strong sunlight causes 30 to 50 percent loss of folate within 60 minutes. Furthermore, light-skinned patients exposed to ultraviolet light for dermatologic disorders have abnormally low serum folate concentrations, suggesting that photolysis may also occur in vivo. Deficiency of folate, which occurs in many marginally nourished populations, causes severe anemia, fetal wastage, frank infertility, and maternal mortality. Prevention of ultraviolet photolysis of folate and other light sensitive nutrients by dark skin may be sufficient explanation for the maintenance of this characteristic in human groups indigenous to regions of intense solar radiation. " RA has scheduled white people to become EXTINCT starting from this deadline. They were giving you hints, tho. Watch these two movies: "Children of Men (2006)" and "The Handmaids Tale (1990)" You will then have the full reality of things yet to come. Also, watch "Knowing (2009)". Notice the two White rabbits (male and female) representing white fertility that are saved along with the two white children. Notice the symbolism of the deeply melanated (black) pebbles that populate the whole earth. Ignoring the Hollywood drama, ultimately, did white people not die from the wrath of RA? In preparing to do battle with RA, so-called 'smart' white people have decided (in secret) to blanket regions of the world populated by white people with aerosols which act as a global sunscreen lotion. They say: "Let us Hide the inevitable second coming of RA from the people, that we may reign for another two thousand years." Or that the 99% melanin dominant peoples who populate this planet do not require such protection and will suffer greatly from this idiocy. WHITE PEOPLE ARE BECOMING EXTINCT, so we shall jeopardize an entire planet in order to protect those not yet born. Survival by any means necessary. This remains the overriding sentiment; White Supremacy. So, in addition to the aforementioned, other White peoples are trampling all over the planet culling off whole masses of non-white peoples, and rendering these cultures defenseless and malnourished. You should now understand why population control is the order of the day. I personally love the sun. Let The Divine Rays of The Sun God Atun RA awash this Earth. Again saw under the sun that the race is not to the swift and the battle is not to the warriors, and neither is bread to the wise nor wealth to the discerning nor favor to men of ability; for time and chance overtake them all. 12Moreover, man does not know his time: like fish caught in a treacherous net and birds trapped in a snare, so the sons of men are ensnared at an evil time when it suddenly falls on them. With the depletion of o-zone layer which was designed to protect earth from harmful Ultra-violet waves which causes much much to much heat upon orb-ship earth. The ozone layer is deteriorating due to the release of pollution containing the chemicals chlorine and bromine. Such deterioration allows large amounts of ultraviolet B rays to reach Earth, which can cause skin cancer and cataracts in humans and harm animals as well. Extra ultraviolet B radiation reaching Earth also inhibits the reproductive cycle of phytoplankton, single-celled organisms such as algae that make up the bottom rung of the food chain. Biologists fear that reductions in phytoplankton populations will in turn lower the populations of other animals. Researchers also have documented changes in the reproductive rates of young fish, shrimp, and crabs as well as frogs and salamanders exposed to excess ultraviolet B Chlorofluorocarbons (CFCs), chemicals found mainly in spray aerosols heavily used by industrialized nations for much of the past 50 years, are the primary culprits in ozone layer breakdown. When CFCs reach the upper atmosphere, they are exposed to ultraviolet rays, which causes them to break down into substances that include chlorine. The chlorine reacts with the oxygen atoms in ozone and rips apart the ozone molecule. About 90 percent of CFCs currently in the atmosphere were emitted by industrialized countries in the Northern Hemisphere, including the United States and Europe. These countries banned CFCs by 1996, and the amount of chlorine in the atmosphere is falling now. But scientists estimate it will take another 50 years for chlorine levels to return to their natural levels. The infant mortality rate is the number of deaths under one year of age occurring among the live births in a given geographical area during a given year, per 1,000 live births occurring among the population of the given geographical area during the same year. High levels of sun exposure during pregnancy, or at birth, could increase the risk of infant mortality. Researchers say the explanation for the relationship between solar activity and infant mortality may be an effect of folate degradation during pregnancy caused by ultraviolet radiation. Crop destruction is the ozone layer depletion “The ozone layer has seen unprecedented damage in the Arctic this winter due to cold weather in the upper atmosphere. By the end of March, 40% of the ozone in the stratosphere had been destroyed, against a previous record of 30%” (BBC News April 5, 2011). “Loss of ozone allows more of the Sun's harmful ultraviolet-B rays to penetrate through the atmosphere. This has been linked to increased rates of skin cancer, cataracts and immune system damage. "With no ozone layer, you would have 70 times more UV than we do now - so you can say the ozone layer is a sunscreen of factor 70," said Dr Braathen” (Ibid.). Gine Roll Skjærvø led a team at the Norwegian University of Science and Technology. The researchers looked at various environmental factors and found a strong link to the number of sunspots and fertility and mortality. Children who were born in the three years of the solar cycle when solar activity peaked had the highest mortality. People born during the years of the highest solar activity lived, on average, five and two-tenths less years than people born during the eight years of lowered solar activity during each 11-year cycle. The greatest mortality was found during the first two years of life. Infants were more likely to die if they were born during a time of greater solar activity. Jupiter’s interesting behavior may explain the kingly aspect of the Star. But there are nine qualifications of the Star of Bethlehem. Many are still missing. How did Jupiter’s movement relate to the Jewish nation? Is its association with the Jewish New Year enough? Where is an indication of a birth? Some might say that the triple conjunction by itself would indicate to a magus that a new king was on the scene. Maybe. But there is more. The last book of the New Testament is, in part, a prophetic enigma. But a portion of the Book of Revelation provides clear and compelling guidance for our astronomical investigation. The apostle John wrote the book as an old man while in exile on the island of Patmos. Perhaps the austerity of this exile or a lack of companionship left him time to ponder the night sky. Whatever the reason, Revelation is full of star imagery. In Revelation, Chapter 12, John describes a life and death drama played out in the sky: the birth of a king. The sheer concentration of symbolism in the stars at this moment is remarkable. These things could certainly lead our magus to conclude that a Jewish king had been born. But even this is not the whole story. These symbols could indicate a birth, but if they were interpreted to indicate the time of conception, the beginning of a human life, might there be something interesting in the sky nine months later? Indeed. In June of 2 BC, Jupiter continued the pageantry. So we can say that God made his decision to Flood the Earth when Noah was 480 years old. God gave man a 120-year countdown. He then found Noah worth saving, so he told Noah to build the Ark with 7 days left to go before the rains. 120 years great flood. It is not a time-limit on a human's life. Consequently, the 120 years measures the time of God's patience before He brought the flood, not the limit on man's lifespan. So based on the context, we interpret 120 years to be the number of years until the Lord brought the flood upon the earth. God said He would only tolerate such extreme sin on the earth for another 120 years, at which point He would wipe out the earth with a flood. This is how we know that the flood came exactly 120 years later. First, notice the context of Genesis 6 is not focused on the question of man's longevity. In fact, the topic of human lifespan is nowhere to be found in the story of the flood. So why would such a topic suddenly become part of the narrative in v.3 but then disappear altogether afterward? This doesn't make sense, so there is no reason to inject that topic into our interpretation. Inserting the issue of lifespan into the narrative of Genesis 6 is an example of eisegesis, which is an invalid, subjective method of interpretation. Then in v.3 the Lord declares that His Spirit will not strive with men forever, which means He will not exhibit patience forever but eventually He will act to correct this problem. At the end of v.3, the Lord declares man's days are numbered, and He will bring an end in 120 years. This is not a discussion of lifespan but of timing for judgment. Even today, we use a similar phrase to indicate someone will eventually receive judgment (i.e., we say "his days are numbered."). Later, we learn that God brings His judgment by way of a worldwide flood. Consequently, the 120 years measures the time of God's patience before He brought the flood, not the limit on man's lifespan. Q. Does the Bible say that it took Noah 100 years to build the ark? A. It is not uncommon to hear a statement like, "Noah built the ark for 100 years." However, there is no mention in the Bible of a 100 year time span during which Noah did anything. One reference in the New Testament (I Peter 3:20) refers to the time during which Noah was building the ark, but does not give a specific time frame, ". . . when the patience of God kept waiting in the days of Noah, during the construction of the ark, in which a few, that is, eight persons, were brought safely through the water." A time span actually stated in the Bible which is often connected to Noah and his building the ark is the 120 years mentioned in Genesis 6:3, "Then the LORD said, 'My Spirit shall not strive with man forever, because he also is flesh; nevertheless his days shall be one hundred and twenty years.'" A common inference made concerning those 120 years is that God intended to judge the world by causing the flood in 120 years. The reasoning then follows that Noah had those 120 years to construct the ark (thus, the source of the remark, "Noah built the ark for 100 years"). However, is that really the intent of God's statement in Gen 6:3? Let's consider the circumstances of Noah's life when God speaks to Noah about building the ark. What God says to Noah is recorded in Genesis 6:13-21, "Then God said to Noah, 'the end of all flesh has come before me; . . . Make for yourself an ark . . . everything that is on the earth shall perish. But I will establish my covenant with you; and you shall enter the ark--you and your sons and your wife, and your sons' wives with you." This appears to be when God first tells Noah to build the ark, and notice, at that point in Noah's life, he not only had his 3 sons, they were married. There are two other chronological details of Noah's life which then allow us to narrow the time frame during which God must have commanded Noah to build the ark. "Noah was six hundred years old when the flood of water came upon the earth (Gen 7:6);" and "Noah was 500 years old, and Noah became the father of Shem, Ham, and Japheth (Gen 5:32)." These two figures indicate that Noah's sons were approximately 100 years old when the flood came upon the earth. This is verified with respect to Shem in Genesis 11:10 which states that he was 98 years old when the flood came. Since it appears that God first spoke to Noah about building the ark when his sons were not only born, but married, it had to have been significantly less than 100 years, perhaps only 60-70 years, from the time God commanded Noah to build the ark to the time God caused the flood. It certainly is reasonable that Noah, his sons, and other hired hands (imagine how incredulous they were--until it began to rain!) could have built what was essentially a large 4 story building in 60 years. But, if indeed, there were just 60 or so years during which "the patience of God kept waiting in the days of Noah, during the construction of the ark," what is the significance of the 120 years mentioned by God in Genesis 6:3? It could be that God simply "waited" 60 years before telling Noah to begin building the ark, thus, when another 60 years had passed, the ark was ready and the 120 years "were up" so to speak. However, I think God had a different intent when referring to those 120 years. In Genesis 6:3 when He says, "My Spirit shall not strive with man forever, because he also is flesh; nevertheless his days shall be one hundred and twenty years." the context of God's statement seems to be more in reference to the lifespan of mortal man. In the days of Noah, people lived on average over 900 years. That average was sustained from Adam (930) to Noah (950). But, immediately after the flood, the recorded life spans of men dropped, and the trend is a dramatic decrease from Shem, who lived only 500 years (!) after the flood for a total of 600 years, to Jacob's son, Joseph, who lived a mere 110 years. There is no recorded lifespan exceeding 120 years after the era of Moses (who died at 120), except Jehoiada, the righteous priest largely responsible for the reformation during the days of Joash king of Judah. "Now when Jehoiada reached a ripe old age he died; he was one hundred and thirty years old at his death. And they buried him in the city of David among the kings, because he had done well in Israel and to God and His house (2nd Chronicles 24:15)." It would seem that his longevity, unique since Moses, was God's reward to him for his faithfulness. On the other hand, the legacy of man is "that every intent of the thoughts of his heart was only evil continually (Gen 6:5)." Could it be that what God intended to do by way of the flood was not only destroy all flesh with the earth, but intentionally bring down the lifespan of man from the extreme age in excess of 900 years in the pre-flood era to a maximum of 120 years in the post-flood age. God may very well have accomplished this through major changes on the earth as an aftermath of the flood. Several lines of scientific evidence available today support this interpretation of Genesis 6:3. 1) The genetic information carried in our DNA is susceptible to mutation caused by several factors, physical, chemical and harmful forms of radiation. We know that aging definitely has a genetic component; thus, harmful mutations accumulating in the human genome (total DNA content) since the flood certainly is a possible physical explanation for the decrease in longevity. 2) As a result of the discoveries made by the Human Genome Project geneticists estimate only an astounding 3% of the total DNA actually encodes information for the synthesis of proteins. Even if we find ten times that amount to be functional in the future, what is the purpose of the other two-thirds of the genetic material? Perhaps all that "junk" DNA represents the relics of past genetic capacity, now lost due to millennia of accumulated mutations. Just as the strata of the earth are riddled with fossils of extinct organisms, so our chromosomes are riddled with "fossils" of extinct genes. The genetic capabilities of Seth and Methuselah are long gone. 3) Many scientists who study aging are surprised at what they are finding. Although, the average lifespan of humans has been increasing over the last century, especially due to advances in medical technologies, the maximum lifespan for humans has not increased. It appears that the maximum lifespan remains "pinned" at approximately 120 years of age! (Cf. Nov. 2003 issue of Discover.) Although some scientists are optimistic about increasing this maximum to even 150 years, such optimism is just that--mere hope. Will we find a "glass ceiling" for the longevity for all humanity? Perhaps that ceiling has been imposed by the predetermined plan of our Creator Who back in the days of Noah decided that allowing sinful men to continue in lives of wickedness for multiple-hundreds of years was going to stop. It apparently did not take Noah 120 years to build the ark, it probably took only half that time, and yet today, God continues to be patient, allowing many to live much longer than 60 years in order that they might come to repentance and faith in the Lord Jesus Christ. But, He has apparently ordained a limit--120 years--at which time, "it is appointed for men to die once and after this comes judgment (Heb 9:27)." A. the Designer was God Himself. We do not need to assume Noah knew anything about ship-building. The instructions for design are given in Gen. 6:14ff. The Bible says the Ark was to be built of "gopher wood". "Gopher" is the actual Hebrew word. In early English translations the meaning of the word was unknown so it was left untranslated. The NIV translates it "cypress wood", however, this is only a guess. It was undoubtedly translated this way due to the fact that cypress wood is highly resistant to rot. What this material was is still a mystery. It could have been a pre-flood wood with which we are not familiar. 3. The Ark was to be coated inside and out with pitch. Again the Hebrew word for "pitch" is obscure. It was more likely some resinous material used not only to waterproof the vessel but also to prevent decay. If Noah was 480 years old when God told him to build an Ark and 600 when the Flood came, it is reasonable to assume that the construction of the Ark took place during this 120 year period (See Gen. 6:3 along with I Pet. 3:20). The need for this preservative was essential. It is also possible that things did not decay as rapidly in the pre-flood atmosphere. Representing children of Israel she was a lowly worker in house care etc,black people.. Her name: Jupiter Jones was born under a night sky, with signs predicting that she was destined for great things. Now grown, Jupiter dreams of the stars but wakes up to the cold reality of a job cleaning other people’s houses and an endless run of bad breaks. Only when Caine Wise, a genetically engineered ex-military hunter, arrives on Earth to track her down does Jupiter begin to glimpse the fate that has been waiting for her all along – her genetic signature marks her as next in line for an extraordinary inheritance that could alter the balance of the cosmos.